Unfortunately people have no direct control over their reproductive systems, however, we still have the power to influence the factors that impact our fertility. Body weight is one of those important factors and by keeping it in the normal range, we have the ability to improve the chances of conceiving. What is the healthy range? Everybody has a different understanding of what healthy body weight is. In everyday life it is based on our personal taste and preferences. From the medical point of view, healthy body weight is evaluated based on person’s medical history and general health. Of course healthy weight is not viewed as a concrete figure on the scale, but rather a range calculated for each person individually. The tool we use the most is called a body mass index (BMI) that measures the body fat based on person’s height and weight ratio. There is a number of BMI calculators available online that measure whether persons body index is in the healthy range. Being overweight can increase the chances of pregnancy complications or even put it at risk. Gestational diabetes, hypertension, need for a c section are just a few from the long list. Being overweight or obese can be associated with the polycystic ovary syndrome which is a very common condition among women who are fighting infertility. Being overweight can cause hormonal problems. Estrogen, the hormone that is produced by the ovaries is also produced by the fat cells. A high body mass index or excess fat may lead to the excessive production of estrogen. This will ruin the hormonal balance in the reproductive system and will finally result in irregular ovulation. Being overweight increases the chance of developing the insulin resistance that can finally lead to the type 2 diabetes. Diabetes is quite a big concern for the fertility and moreover, insulin resistance is associated with PCOS. Having a high BMI is also believed to impact the effectiveness of fertility treatments such as IVF. The last but not least, being overweight affects not only female, but male fertility too . 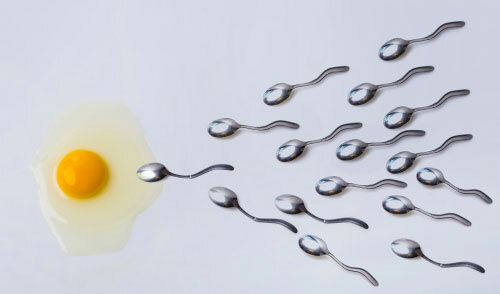 In men, high BMI can lead to poor sperm quality as well as erectile dysfunction. Being underweight, similarly to being overweight is very likely to cause hormonal disbalance and affect ovulation. Underweight women may produce less estrogen than needed, also affecting the hormonal balance in the reproductive system. Being underweight can lead to irregular or even completely absent menstrual cycles. Underweight is a woman who has a body mass index lower than 18.5. « Comparison Between IVF And ICSI – Which One Is Better?